If you were part of that minority pack that still follows the constant lies and distortions of the Western, mainstream, corporate media, the Brexit referendum which took place on June 23rd was about racism. According to the story line, angry rightwing racists of violent inclinations desired to leave the EU to avoid having to accept more dark-skinned immigrants into England. Despite the constant propaganda against the exit, polls indicated that more favored leaving the EU than remaining until a female Member of Parliament, Jo Cox, was killed by a man that a witness said shouted “Brexit.” Cox was an opponent of leaving the EU. Cox’s Murder was in fact used to drive the aforementioned propaganda. The British government, headed by David Cameron, and its prostituted media apparatus used Cox’s murder to drive home the propaganda that violent racists were behind Brexit. However, other witnesses gave a different report. The leftist Guardian, which led with the propaganda line, did report later in its account that, “Other witnesses said the attack was launched after the MP became involved in an altercation involving two men near where she held her weekly surgery.” Of course, we will never know, because Cox’s murder was too valuable of a weapon against Brexit. There is no doubt that many in the UK are disturbed at the transformation of their country in a 52-48 vote. One doesn’t have to be a “racist” to feel that one’s country is being stolen from them by peoples of a totally different socio-economic background and culture. The British have a long history of fighting off invaders, and many believe – correctly or falsely – that they are experiencing some kind of an invasion, although obviously not an armed one. An armed one, of course, would not have the government’s and media’s support. When the British people hear pundits pronounce that immigrants contribute more to the UK than they absorb in social payments, what they hear is inconsistent with their experience. Moreover, many British are tired of having to avoid entire sections of their cities, including London and Birmingham, because of safety concerns. All this lead us to this hypothesis: Is the UK being led down the rabbit hole of its own destruction? It is a propaganda designated choice to call these concerns racism rather than cultural defense, and the UK’s political establishment clearly made that propaganda choice. Little wonder why so many British nationals no longer believe that the British Establishment represents Britain. But let’s give the propagandists the benefit of the doubt and for sake of argument assume that Brexit was about racism. What was the opposition to Brexit really about? Most certainly was not about helping the refugees from Washington’s wars that the UK government has enabled. If the British establishment cared so much for the refugees seeking shelter from Washington’s invasions, bombs, and drones, the British establishment would not have supported Washington’s attacks on these poor, defenseless people. Opposition to Brexit was based on two powerful interests of Washington and New York. - Did New York seek the end of London as a global financial center? - Stopping the Domino Effect. One is the interests of the New York bankster cabal and Wall Street to eliminate the UK as a financial center competitor. This blatant fact has escaped the notice of “The City” and BOE (Bank of England). The British have forgotten that they only have one foot in the EU, because the UK was permitted to keep its own currency. The UK did not use the euro and, thus, retained the power to finance the British government. Greece, Portugal, Spain, Italy, France, Germany, and the rest of the Euro Zone, do not have this sovereignty. They are all dependent on private Rothschild banking structure for financing. In order to trick the UK into joining the EU, the British were given special privileges. However, these privileges could not last forever. The EU process is one of political integration. Jean-Claude Trichet, at that time the president of ECB (European Central Bank) said that to complete the political integration of Europe, the fiscal policies of member states must be centralized. As such, it was impossible to centralize fiscal policies if the UK was to remain an independent financial center with its own central bank and currency. 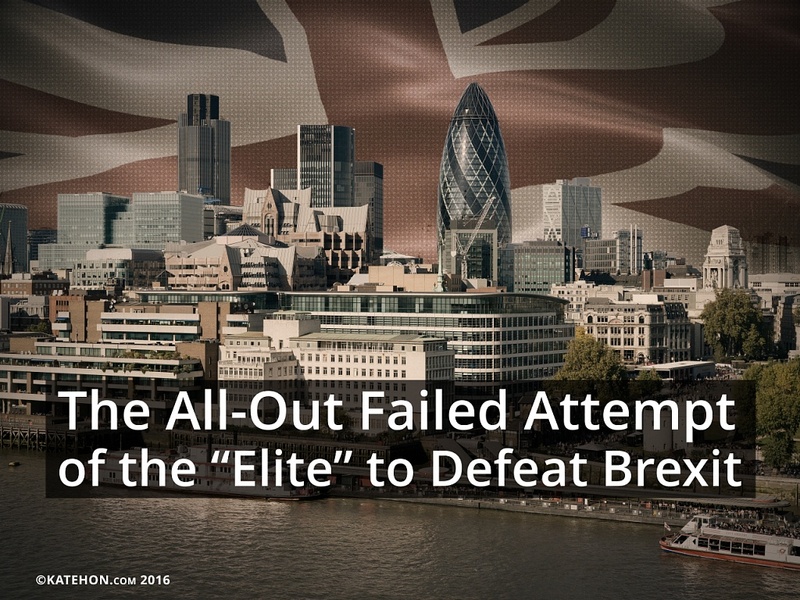 So why did the “elites” have to stop Brexit at all costs? Wall Street understands that the defeat of Brexit meant a shortened lifespan for London as a financial center, as it is impossible to be a financial center unless a country has its own currency and central bank. As it is impossible for the UK to be a member of the EU and not operate under the ECB, once the Brexit referendum would have been defeated – or so they hoped – the process of gradually forcing the UK into the euro would have begun. The other powerful interest is the interest of Washington to prevent one country’s exit from leading to the exit of other countries. As CIA documents found in the US National Archives make clear, the EU was a CIA initiative, the purpose of which was to make it easy for Washington to exercise political control over Europe. It is much easier for Washington to control the EU than 28 separate countries – now 27 with Brexit. Moreover, if the EU unravels, so likely would NATO, which is the necessary cover for Washington’s aggression not just in the oil rich Middle East but Russia and the greater SCO (Shanghai Cooperation Organization). The EU serves Washington and the “elite” 1%. It serves no one else. The EU is a destroyer of national sovereignties and peoples. The intent was always for the British, French, Germans, Italians, Greeks, Spanish, Portuguese, Irish, and all the rest to disappear as peoples. Brexit was the last chance to defeat this hidden Novus Ordo Seclorum (One World Order) agenda. Apparently, the British people voted without having a clue as to what was at stake and what was/ is the grander geopolitical ramifications of their vote. Nevertheless, they voted correctly for a change.